1969: Filmed in the most dangerous wastelands, the Kalahari Desert, the film is the creation of Jamie Uys. LOST IN THE DESERT is a story of suspense, conflict and incredible human courage as an 8 year old boy and his dog are left to face this vast wasteland alone after an aeroplane crash, while an army of men and machines penetrate the desert in search of them. The film is based on true events and is sure to hold you spellbound! Few have ever entered the deadly, mysterious Kalahari … and lived to reveal its secrets! DIRKIE (WYNAND UYS) MEETS THE FURY OF THE MOST DANGEROUS WASTELAND ON EARTH IN “LOST IN THE DESERT”. Apart from the practical difficulties associated with filming a movie in the desert, what made Dirkie even more of a feat was that it was filmed twice! Once in Afrikaans (an indigenous South African language) and once in English. In some way or another each one of Uys’ Mimosa pictures provided the spark for the next one. The filmmaker was flying to Namibia to promote "Die Professor en die Prikkelpop" (1967) when he became hypnotized by the sprawling red dunes of the Kalahari. As a seasoned cinematic storyteller he realized that, in spite of its majesty, images of dunes will only mesmerize audiences for a few moments. He had read of a plane crash in which only a small child survived. Uys’ script told of a sickly boy (Wynand Uys) that is sent by his pianist father (Jamie Uys) to a dryer climate. The plane carrying the boy crashes; he is lost in the Namib Desert together with his dog. The father frantically searches for him… Initially entitled "The Fallen Sparrow", Uys later decided on "Dirkie" (the English version was released as "Lost In The Desert" or "Adventures In The Red Desert"). 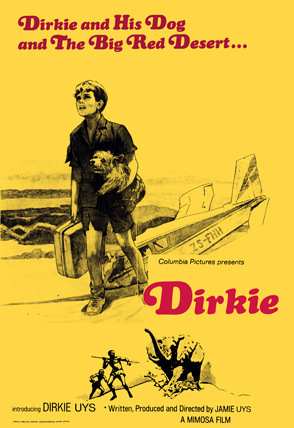 Dirkie’s story might have been a simple premise but the production was a grueling epic. Most directors that have filmed in the Namib usually did not venture away from the beaten track but said Uys, “We are going to film at even the most inaccessible places.” Uys and Mimosa negotiated permission to film at places that are legally off-limits to the public; including parts of Namibia’s confined diamond zone. Uys travelled thousands of miles across Namibia, first by car and then plane, location-scouting. Then the cinematic endurance race started. Actual filming stretched from the Kalahari Gemsbok Park to Etosha to Windhoek to Walvis Bay, Rhehoboth and the restricted diamond zone. The Uys-team would drive 11 000 kilometres through the wilderness to make the picture. Challenges abounded: The R250 000 budget didn’t allow for a glamorous safari – it was bundu bashing all the way. They would camp far away from civilization (and sometimes water) which made planning for the production an intricate operation. Once a week a plane brought provisions from Windhoek, otherwise the film-makers were on their own. The small crew of 16 had to obey food and water rations. Temperatures were extreme: The nights icy; the days hellish. Only a small window of time existed for optimum filming. Tents, equipment, notes and supplies were constantly blown away by desert winds. They tented in the Namib wilderness amidst roaming beasts. Animals used in the film, ranging from a leopard to a hyena to a baboon to snakes and scorpions, an Alsatian and Dirkie’s pet Cairn terrier had to be tended to as well. These animals were tamed but not trained which complicated the filmmaking. Furthermore Jamie Uys suffered from a unique medical condition. The intense heat made his lips burst into a (painful) bloody mush. When Uys (lead actor / scriptwriter / director / principal cameraman) became incapacitated the production stopped, sending costs soaring. Dawid, a local Toppenaar, played a Khoi San without ever having seen a movie, which complicated the production. However, securing an indigenous child actor was almost impossible. Remembering an old legend, the secluded local tribes were convinced that Uys wanted to buy their kids as slaves. After gentle negotiations (as well as a change of filming-location) the director acquired his actor. However, the two most treacherous challenges facing Uys were dunes and sand. “At night he has nightmares about those footprints,” a concerned Hettie Uys, Jamie’s wife, mentioned. The red dunes (the film’s muse) were nightmarish. The boy was supposedly alone in the desert. When a dune shot (towering things in the Namib) demanded a retake a different virgin dune without inerasable footprints had to be found. Secondly, the fine desert sand got into the cameras. It took only a few sand particles to obliterate the delicate film. Uys could not evaluate the filmed material in the desert. The film was flown from Namibia to London where it was developed by Eastman / Technicolor. Only back in Johannesburg could he see the material (making editing a nightmare.) If it was damaged or Uys was unhappy with a scene, the whole production team had to trek back and reshoot; prolonging production and wrecking the budget. At long last – and after a lot of public anticipation and speculation – "Dirkie (Lost In The Desert)" was released in 1969. It was more than just successful: It set South African box office records. The 13 prints Mimosa Films had made were not nearly enough which meant Mimosa officials had to travel across the country to deliver copies. Boet Troskie and Mimosa Films brokered a masterful deal for Dirkie’s international distribution with the Columbia Pictures Corporation that screened it almost worldwide with tremendous success, putting Uys squarely on the international studios’ radar.